How wide should my sashing be? Thread: How wide should my sashing be? Is there a rule for sashing width? I am making a baby quilt using a Jelly Roll and the 3 Dudes Quilting method that the Missouri Star Quilt Company has a YouTube video for. Should my sashing be the same as the Jelly Roll strips? Or a little bigger? TIA for your help! I can't help, your blocks look perfect to me. Wonderful job. I don't think there is any rule. Either width, or no sashing at all, would look good. 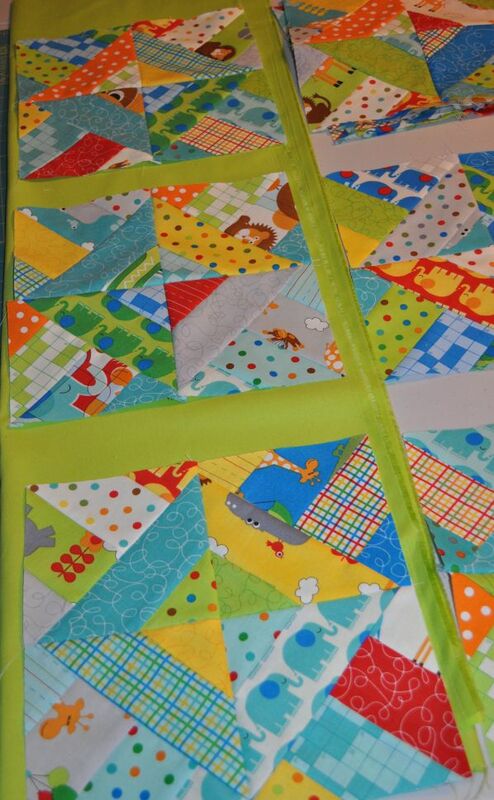 For me personally, I'd pick a width that made the quilt the size I wanted, and that I had enough fabric for. I love the fabrics you used. This is going to be a very pretty baby quilt. My sashing depends on how big I want the quilt to end up or to do a certain design. I think the jelly roll strip size would look nice with your pretty blocks. I think it comes down to personal choice and if you want the sashing fabric to really stand out or fade away. In your case the wider green really emphasizes the other greens in the quilt. If you're not wanting it quite so green then maybe audition it with a finished 1" sashing & see how you like that. The rule is: If it looks good to you, it's right! Personally because I'm lazy and it conveniently gives you more 2 1/2" scraps to put in your scrap pile, I'd do the sashing the same width as the jelly roll fabrics, but if you need to fill out or take in the size a smidge you can use whatever you'd like.. no one is going to take a ruler to your finished quilt and ask why you didn't opt for "_" width sashing. The quilt is lovely and colourful. A tip from a non quilter make the stripe width have some relationship to the width of the block. Ie 1/8 or 1/16 or 1/10 etc. it will then look more coordinated on size. you don't want the sashing to (over-power) the quilt blocks- there are no rules---but a fraction of the block size does help it look 'balanced' I generally decide by how much larger I want the quilt to be- then figure from there- if a 12" block I generally use a size that will (go into) a 12" block equally---such as 2", 3", 4", 6"...if a 9" block then 3" or 4 1/2" ; if a 6" block then 2" or 3"...see what I mean?...but just lay out folded fabrics in different widths, step back & see what you like- that's the size to go with. My vote is almost always for no sashing. Sashing takes away any secondary patterns that blocks set together can create. Plain wide sashing is just boring. A very narrow sashing can add another layer of design. I like the narrower width shown at the top of your photo, rather than the one at the bottom, the latter of which is about the width of the strips in your blocks. But that being said, you've already had some good advice. Go with what makes you feel good, whether it's none, the narrow, or the wider strips, or to make your quilt a certain size. I don't really know what size sashing you should use..... like so many others, I usually decide based on the size I want the finished quilt to be. But, I have to comment on your fabric selection..... it is so cute!! Perfect for a baby quilt. Your choice of sashing color is outstanding and is something I would not think to do. Really makes your quilt special! Go with what your eyevtells you looks good. That's one of the reasons I love my design wall. I can try out sashing sizes by folding the fabric and determine which I like. Since I use the sashing to showcase my blocks, it is always toward the smaller size. I was going to put all the blocks together, but I have major accuracy issues. I think the sashing will help hide this. I love everyone's replies, thank you! Hopefully I'll get the top done this afternoon and I'll post some updated pictures. I'm trying to get two baby quilts to the binding point so I have something to hand sew while camping over Memorial Weekend. I made the same quilt and didn't use any sashing. But as the others say, it's your quilt, it's your decision. Whatever you think looks good, but you don't want to see the sashing instead of the blocks. Your fabrics are beautiful.